This light and sheer outerwear is perfect for those who likes to experiment with more than just one look. This poncho is so versatile and can be worn for both formal and informal affairs. From casual to the beach (as a cover up) this beautiful number is up for grabs! 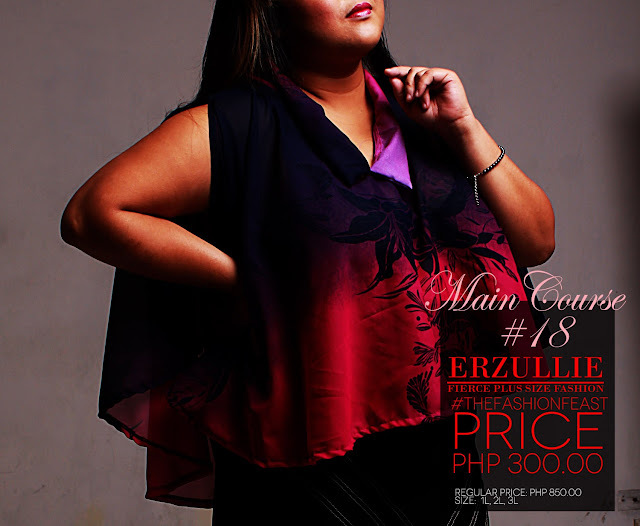 Regularly priced at PHP 850 pesos, for The Fashion Feast sale event, it will just be PHP 300! This constructive cropped outerwear is perfect for those who just wants coverage for the sleeves and want to show off their cute top or dress! Regularly priced at PHP 700 pesos, for The Fashion Feast sale event, it will just be PHP 300! Recently, I have asked for new links for local plus size blogs to read and I was sad to know that there are not a lot of them given like before. The number of active ones in my list as well has diminished, and I am wondering why. #1 They knew who they are, who their audience are and kept it that way, keeping content fresh and developed for their old and new audiences. #2 They know their image and how to market it through their posts. #3 Their website is easy to read, navigate and is constantly updated. But of course, these are just nitty gritty stuff. Ultimately, I think what made them last long is their passion for their job. Serious blogging is hard. It is about constant planning, creating and editing, merging creativity with technical know-how. At the end of the day, the promise of fame and fortune will not be enough to keep these people motivated. These serious blogs exists because, to them, this is their life. It is that beauty that people keep on following them, showering them with support each and every time. How about you, what do you think makes bloggers last?